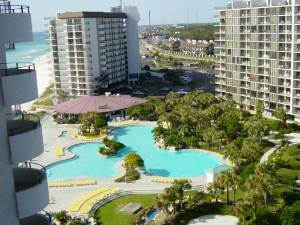 Our ONE BEDROOM and TWO BEDROOM ocean front condos are both located in Tower 3 at Edgewater Beach Resort, Panama City Beach's premier vacation destination. PLEASE INDICATE IF YOU ARE INTERESTED IN RENTING MY ONE BEDROOM OR TWO BEDROOM CONDO WHEN SUBMITTING INQUIRY. 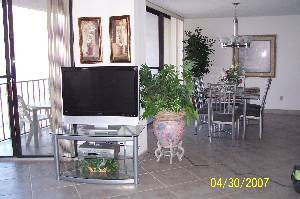 Both condos have been completely renovated and are equipped with high speed internet at no charge to our guests. Edgewater is a gated community with 24/7 security. Enjoy breathtaking views of the crystal clear emerald green waters of the Gulf of Mexico and miles of sugar white sand beaches from the private balcony of both units. 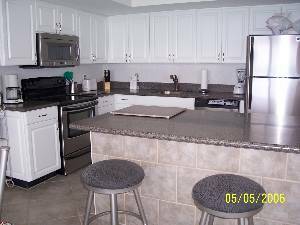 Both kitchens are newly renovated and fully equipped with all new major appliances plus microwave, dishes, pans, coffee maker, toaster, blender...everything you will need to prepare a gourmet meal or just a snack. The living room in the ONE BEDROOM condo has a queen size sofa bed, 25" TV with cable/HBO, DVD, stereo/CD player and telephone. The bedroom has a king size bed, TV with cable/HBO, clock radio and telephone. The TWO BEDROOM living room has floor to ceiling windows facing the ocean with a 37" flat screen, LCD TV with cable/HBO, DVD/VCR combo, stereo/CD player and cordless telephone. 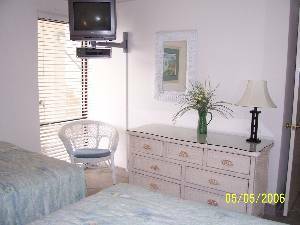 The master bedroom has a king size bed with adjoining bath with large walk in shower, cable TV/HBO, DVD/VCR combo, telephone and clock radio. 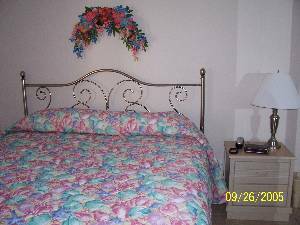 The guest bedroom has two full size beds, cable TV/HBO, DVD/VCR combo and clock radio and access to the second full bath. Both condos have washers and dryers. All linens are provided except beach towels. Enjoy casual dining at the Palapa Beach Club, Bimini Sand Bar Cafe, and our very own Pizza Hut. We even have a Starbucks Coffee Shop, all located on site. Also located on site is a 9-hole, par 3 golf course, putting green and pro shop, 12 lighted tennis courts, shuffleboard, jet skis, parasailing, beach volleyball, hot tubs, state-of-the-art fitness center and spa, hair salon, ice cream shop with Starbucks coffee. Located just across the street at "The Shoppes at Edgewater" shops, restaurants and arcades. Many attractions for children including Gulf World, Zoo World, Shipwreck Island Water Park, and Coconut Creek Family Fun Park with the "Gran Maze" and two 18-hole miniature golf courses. RATES LISTED BELOW ARE FOR TWO BEDROOM DELUXE - PLEASE CONTACT OWNER FOR ONE BEDROOM RATES. 11,500 sq. ft. Lagoon Pool with waterfalls, palm trees and tropical plants. TWO BEDROOM Condo - Open living room and dining room. 38" flat screen TV with cable/HBO. Also, Comcast high speed internet. TWO BEDROOM CONDO - Newly renovated, fully equipped kitchen. 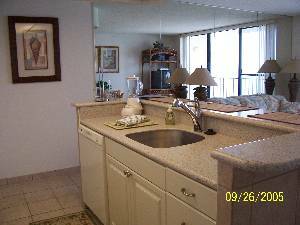 TWO BEDROOM Condo - Guest Bedroom with two full size beds, cable TV/HBO, DVD/VCR combo, clock radio. ONE BEDROOM CONDO - Newly renovated kitchen, fully equipped. ONE BEDROOM CONDO - King size bed, TV with cable/HBO, telephone and clock radio. View from balcony of one and two bedroom condos. Nick and I have just completely renovated our one bedroom, ocean front condo. All new appliances in kitchen, new cabinets and Corian counter tops. Carpeting has been removed and tile floors have been installed throughout. Bathroom has been also renovated. Hope you enjoy our condo! Winter 1/1/2013 3/2/2013 - - $1,500.00 1-2 Mths. Call for rates for one bedroom condo. Rates include all taxes and end-of-stay cleaning fee. NO HIDDEN CHARGES !!!! Deposit: ONE BEDROOM - $200 refundable security deposit ($300 Spring Break) due 10 days from date of reservation. 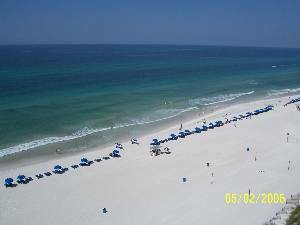 TWO BEDROOM $300 refundable security deposit ($500 Spring break) due 10 days from date of reservation. Deposit returned after departure, inspection by my housekeeper for any damage, and the return of the keys and pool tags. Cancellations and Refunds: 30 day cancellation notice required for return of deposit. Other Fees: The weekly rates include all taxes and fees - no hidden charges. Less than a week, add cleaning fee of $40 for 1 BR and $50 for 2 BR.